We know that China produces cheap copies of all most everything these days - iPhones to Bentleys, Chanel to Louis Vuitton - nothing is beyond them. But now the nation of so many is developing its own full-bodied red wines in a move that will send shivers down the spines of the French and the Spanish and have the Californians and Chileans reaching for their handguns. What's more, the Chinese have already begun exporting their Cabernet Sauvignon to the UK. Tesco will be the first supermarket giant to sell their Chateau Moser XV Cabernet 2015, which now has the second biggest acreage of vineyards after Spain. The wine, which will retail at £7, is described by Tesco's master of wine, as smooth, full-bodied and fruity. 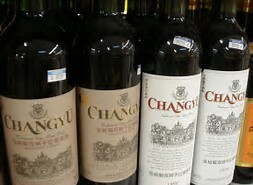 Sainsbury's meanwhile, plan to sell the Chinese Changyu Noble Dragon which it labels as 'floral' for £8. China is one of the world's biggest consumers of wine, drinking almost two billion bottles of red each year. Now they are also becoming one of the largest wine-producing countries in the world. So will it be a glass of Chinese with that chateaubriand steak, this weekend?